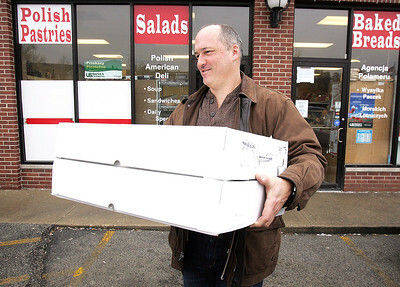 H. Rick Bamman - hbamman@shawmedia.com Todd Boccabella of picks up his order of 170 Rosmart Deli paczkis for employees at Stanley Machining and Tool Corp. in Carpentersville. H. Rick Bamman - hbamman@shawmedia.com Rosmart Deli employee Kathy Pinkosz-Kolenda fills a Paczki order Tuesday morning in Algonquin. The paczki, a doughnut-like pastry that originated in Poland, is a popular seller just before Lent. H. Rick Bamman - hbamman@shawmedia.com Some of the 2 to 3000 fresh paczkis await purchase Tuesday at the Rosmart Deli in Algonquin. Owner Robert Rosinski and wife Dorota have been serving customers for the past seven years. Rosmart Deli employee Kathy Pinkosz-Kolenda fills a Paczki order Tuesday morning in Algonquin. 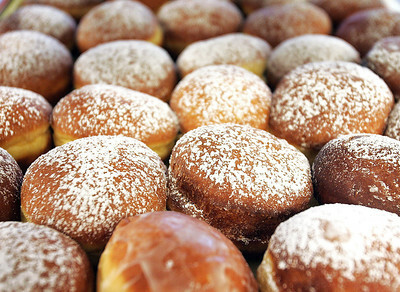 The paczki, a doughnut-like pastry that originated in Poland, is a popular seller just before Lent.